Choosing the right type of hardwood flooring for your home should not be taken lightly. There’s more to it than just going to your local dealer and placing an order. You have to pick among different hardwood species with varying sizes and types of finish. On top of these, there are also three hardwood cuts that you need to choose from. You may be thinking that this is no longer necessary, and whichever cut will do. However, you’ll be surprised that the type of hardwood cut plays important roles in your home flooring. The most common among the three hardwood cuts is the plain-sawn, also called ‘flat-sawn’. Plain-sawn hardwood planks are the cheapest because they are the easiest to make. Plain sawing means cutting the lumber from end to end and perpendicular to the growth rings to produce parallel and wide hardwood boards. This type of cut is the most efficient because it maximizes the number of planks that can be created from a single log. This type of cut is the most efficient because it maximizes the number of planks that can be created from a single log. Production of wooden tables, chairs and other furniture often use plain-sawn hardwoods because of their attractive appearance. Plain sawing through the tree rings give hardwood planks the natural loops and swirls design that is sought after by many homeowners. However, there are some disadvantages of using plain-sawn hardwoods despite its good looks and popularity. As they age, plain-sawn hardwoods are more prone to movement. They are also more inclined to absorb moisture in the air compared to the other hardwood cuts. This causes the sides of the hardwoods to expand and result in a convex or concave-shaped cupping. Another way hardwood planks and boards are made is by cutting in quarters through the middle. After that, each quarter is cut to planks from the wood’s core to the outer part. The planks are also cut perpendicular to the growth rings just like with flat-sawn hardwoods, but with quarter-sawn hardwoods, the produced grain patterns are finer and straight lines rather than round or swirling. However, hardwood boards created from quarter sawing are more expensive due to the fact that not the entire tree material is utilized when creating them. Those who are looking for more stability and minimal movement for their hardwood flooring use quarter-sawn planks. These hardwoods are less likely to be affected by moisture and changes in temperature, which make them resistant to expanding and shrinking. 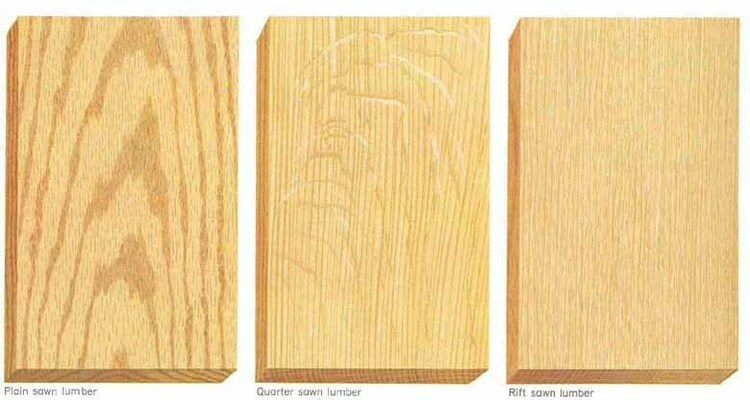 Quarter-sawn hardwoods are also less prone to cupping and crowning. In terms of appearance, they are the best for making musical instruments, fine furniture, and medium-lustered hardwood flooring materials. Rift-sawn hardwood is the most expensive type of hardwood because of three reasons. First, it is the most difficult to produce. Logs are cut radially perpendicular to the growth rings. This way of cutting leaves more part of the tree unused and wasted. Second, it is the most stable. Compared to plain-sawn hardwoods, which are wider, rift-sawn hardwoods are narrower, more compact, and the least prone to movement. They have high-resistance to cupping, moisture and temperature change. Lastly, rift sawing produces the finest vertical straight grain patterns on each plank, which are rare and are used to create high-end furniture and wood-works. Hardwood producers that are aiming to create specialty materials often use rift sawn hardwood boards. It’s important that you choose wisely among the three hardwood cuts. Installing plain-sawn hardwood flooring materials maybe pocket-friendly at first, but if you are living in places with high humidity like beach and coastal areas, you might find yourself changing your flooring sooner than you expected. On the other hand, quarter-sawn and rift-sawn hardwoods are more expensive, which not all homeowners can afford. They are also narrower that when installed, they look less natural looking compared to wider plain-sawn hardwoods. Yet, they are the most stable type of hardwood and are the best investment to last for a long time. Whether you choose the hardwood flooring materials that are plain-sawn, quarter-sawn, or rift-sawn, it is also important that you have them installed properly. It is best to get help from professional installers, who have years of experience in creating the best-looking and long-lasting hardwood flooring for properties, just like BC Best Flooring. Call us for all your hardwood flooring installation needs near Vancouver and Burnaby area.